Does academic freedom entitle university professors to be as provocative as they wish when expressing their views on issues of the day? This question has come alive with three recent cases involving professors making politically charged – some would say incendiary – statements on controversial issues. Are professors just people with jobs? The first case involves Steven Salaita, whose offer of a tenured appointment at the University of Illinois was rescinded because of charged comments he made on Twitter last year about Israel and its actions in Gaza. Second is the case of Saida Grundy, a new professor of sociology and African-American studies at Boston University, who has been called out for contentious tweets about race. Third is the matter of Jerry Hough, a chaired political science professor at Duke who penned what many saw as a racist diatribe in the comments section of a New York Times editorial about happenings in Baltimore. The details of these situations differ, but there are common threads. Each features a professor in hot water for speech delivered outside the confines of academic employment. Each involves expression that, while being objectionable to some, is constitutionally protected speech. Each has aroused the ire of stakeholders, such as students, colleagues, alumni and other interest groups. And as a result, each has forced university leaders to wrestle with a three-way collision involving academic freedom, free expression and institutional reputation. These professors–like all of us in tenure-track academic appointments–are employees with jobs at universities that pay their salaries. So, one way to view these cases is through the lens of employment. Within the larger landscape of worker rights in a free society, the tension between our right to speak as citizens and obligation to our employers as job holders is contested terrain–an issue I explore at length in my book on the legal, ethical and managerial dimensions of free speech in and around the American workplace. The employment-at-will system of labor law in the US, which in the absence of a contract lets employers and workers terminate the arrangement at any time for any reason, means that private sector workers have virtually no free speech protections against employer wrath. If your boss doesn’t like your off-work speech, even if it has nothing to do with your job or your employer’s business, you can be fired for it. For instance, consider the Alabama woman who lost her job in 2004 for having a John Kerry bumper sticker on her car in the factory parking lot. Workers in public sector jobs have greater protections. In situations involving government rather than a private entity as the employer, Supreme Court rulings over several decades have upheld workers’ rights to speak on matters of public concern without risking their jobs. A handful of states give workers in the private sector some of the free speech protection that government workers have through what are known as “lifestyle discrimination” statutes. These are laws that bar employers from punishing workers for off-work activity, including speech, that is legal and poses no significant threat to an employer’s business. But these protections for government workers (and private sector workers in a few states) are enforced only up to a point. When someone fired for his or her speech files a lawsuit, the court weighs the worker’s right to speak against the employer’s right to a functional and efficient workplace. Analyses of case law indicate that courts are inclined to tilt the balance in favor of employers. The public-private distinction is relevant to our three recent cases of “professorial provocation.” This is because one of the three – Salaita at Illinois–involves a public university. 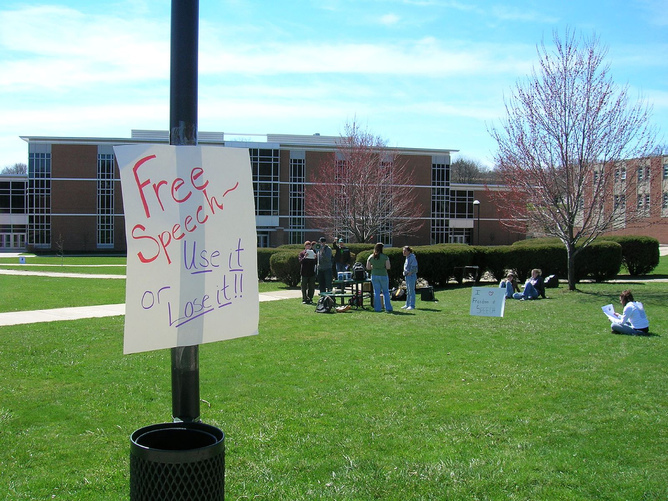 While universities are places for ideas and free speech, they do have cautionary caveats. Having crafted faculty employment policies as manifestos of mutual obligation, universities coping with professors who speak scandalously find themselves in the role of an arbiter of the boundary between freedom and responsibility. The trustees probably figure they can fend off Salaita’s lawsuit – a not unreasonable expectation, to judge by a new legal analysis showing that courts tend to side with university claims that a professor’s speech disrupts its academic mission. Professor Barry's research and expertise lie in two areas: (1) social issues in management, including ethics, public policy, and workplace rights; and (2) the psychology of interpersonal and group behavior in organizations, including power, influence, negotiation, conflict and justice. He has published on these topics in numerous scholarly journals and volumes. Prof. Barry's current and recent research explores the social context of ethical decision making, the intersection of ethics and emotion, deception in negotiation, and ethical aspects of group process. A current book project explores the role of political ideology in the exercise of corporate influence on public policy. His previous book at the intersection of business and policy, examining free expression and workplace rights from legal, managerial, and ethical perspectives, was Speechless: The Erosion of Free Expression in the American Workplace.